Laszlo Krasznahorkai’s sentences intimidate: they metastasize and topple across multiple pages at a time, a labyrinthine chain of clauses begging for the release of a full stop. In a folkloric novel like 1985’s Satantango, about a rural village and a devilish trickster, this effect is vertiginous and unsettling: Krasznahorkai’s claustrophobic prose drops in monolithic bricks, as if forming not a novel but an obelisk. To read Krasznahorkai’s novels is to experience the dreadful and awesome capabilities of the written word and to struggle towards their clarity and fulfillment. 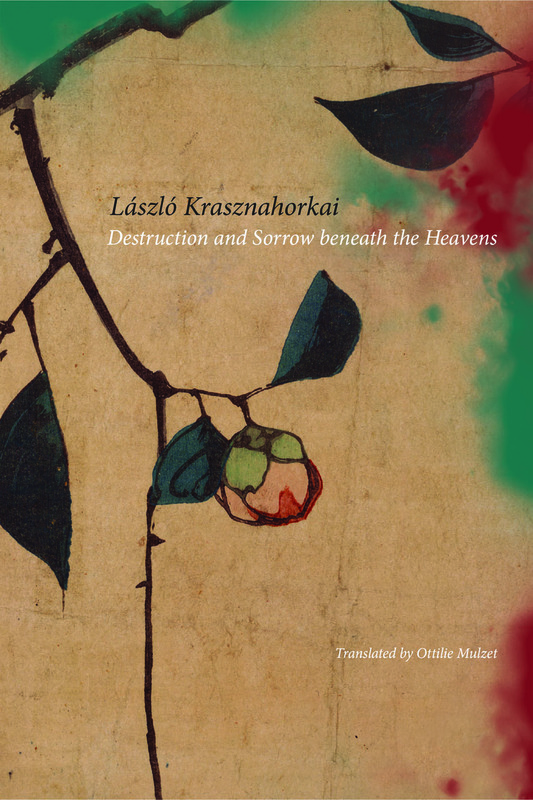 Luckily for the easily-intimidated reader, the compelling Destruction and Sorrow beneath the Heavens presents a different sort of Krasznahorkai. Gone is the grim greyscale of the author’s fantasies: here, the collection chronicles the author’s search for spiritual and philosophical authenticity while travelling through China. And, curiously, it seems his mind is already made up. China is a future-centric metropolis racing towards the digital age at the expense of tradition, and Krasznahorkai teems with disappointment at every historical stop on his journey. “So have a look,” he writes, “here is Nanjing with its 2,000-year-old history — so fatal, and disastrous, because no one can stop this course of development any longer, and no amount of strength can turn it back any more, because what is going on here cannot be remedied….” While Krasznahorkai’s signature style still runs abound in Destruction and Sorrow beneath the Heavens, the author is reframed. Instead of imagining him in a warlock’s cloak with an inkwell full of blood, he’s a curmudgeonly old man with a tape recorder, whose erudition won’t help him navigate the strange new world of contemporary China. Stein’s dissatisfaction is carried throughout the entire book with frustrating consistency. For Stein, everything needs a meaning and significance that can be traced back generations. For instance, he questions a temple that is renowned for its traditional teachings of Confucius, wondering how “traditional” it can be teaching in modern-day China. There’s not really a cure for Stein’s stubborn attitude, either: the glory of centuries-old China is centuries-past. Instead of continuing to seek the same impossible vision, he must find a new way of looking. Krasznahorkai’s relentless prose clicks familiarly with this search for satori (a Buddhist term for sudden enlightenment): Destruction and Sorrow beneath the Heavens reads almost like the wiser, ornery counterpart to a Jack Kerouac novel. Although more controlled that the beatnik stream-of-thought, Krasznahorkai’s search for the essence of tradition by way of meandering, exploratory sentences is surprisingly recognizable, and a stylistic humbling that makes this riveting collection all the more palatable. Eventually, Stein does learn something: in a discussion about the art of the Chinese Garden, he discovers there is a way to explore tradition that’s directly connected to the passage of time, to a lifespan. The poet Xiao Hai tells Stein that he too strives for traditional Chinese culture but that it is “completely obvious that classical culture is nothing but the personal path which leads to it. Culture, then, only truly becomes culture when it is embodied in someone.” “Culture is a living thing,” he explains. It is with this realization that Destruction and Sorrow beneath the Heavens begins to take the form of a rewarding spiritual journey, and not just appear as a series of cultural disappointments.